This was a 12 mile walk following the Nuttall route over the Aran Fawddwy ridge via Pen Yr Allt Uchaf and Drysgol and returning down Cwm Cywarch. The weather would have been good for March – cloudy at first followed by a cold wind and then driving rain – but was pretty poo r for July. It started with a steady climb up the side of Hengwm valley on a clear path, but then I split off for a direct climb up to top of Pen Yr Allt Uchaf. The climb is hard work and with hindsight I’d recommend following the main path up and tracking back to the indistinct summit. After Pen Yr Allt Uchaf it’s a fairly straightforward walk across to Drysgol and Aran Fawddwy itself, though I managed to wander of track slightly and had to do some bracken bashing and heather hopping as a consequence. 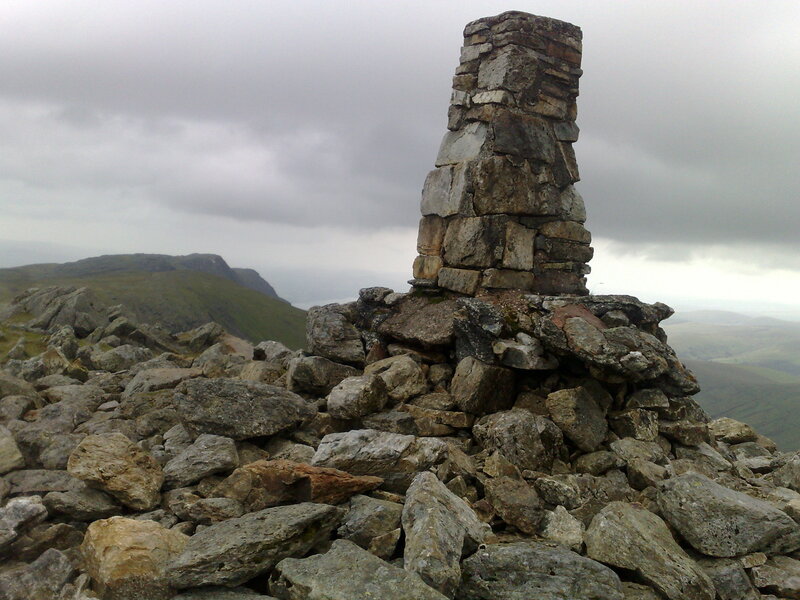 I (deliberately) detoured off to include the less than remarkable summit of Gwaun Lydan, which provides good views particularly of Aran Fawddwy itself. Drysgol provide another fine perspective and has a poignant memorial to a member of a RAF mountain rescue team killed by lightening while on duty in the area. From then on it’s a good steady walk up to the spectacular Aran Fawddwy and then along the ridge to Aran Benllyn (via the intermediate Erw Y Ddafod-Ddu.) On a fine day the views must be wonderful but even with clouds and mist (and eventually strong rain) it was still impressive: looking south to Pumlumon, west to Cadair Idris, across the Arans and north to Bala. 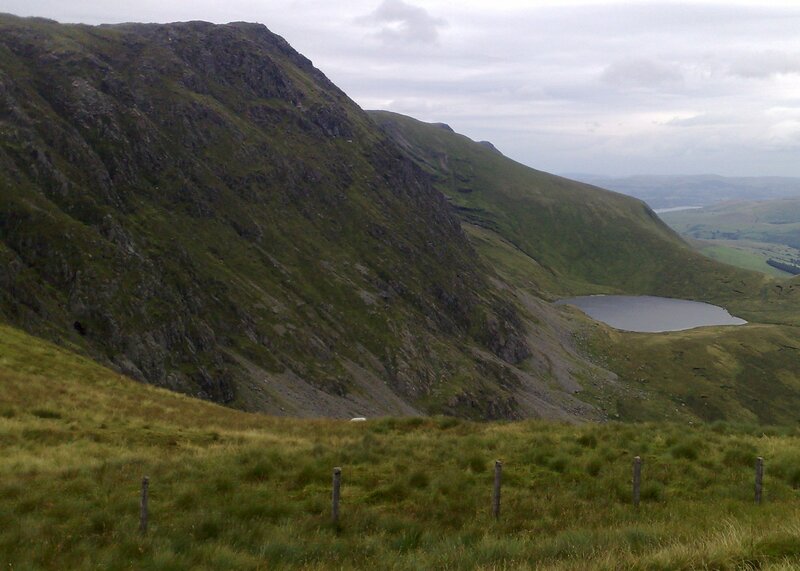 There is also the precipitous view down to Creiglyn Dyfi, the lake beneath the east face of the Aran Fawddwy ridge. After Aran Benllyn, I wound back behind the ridge to the head of Cwm Cywarch, with detours for Gwaun y Llwyni and Waun Camddwr. Some of this is very boggy and there are boards across the worst bit – but these can be very slippy in the rain (I slipped off one into the mud while not paying enough attention as I ate the last of my lunch). The rain was coming in very heavy squally now and I was glad to make the path that runs beside the waterfalls down Cwm Cywarch. A good section of the walk on even a foul day but it would be lovely on a fine day with more time. I didn’t see a single person during the whole seven and half hours I was out – except for one guy booting up as I left the car park. The weather may have been less than perfect but this was still a Friday in late July. Hopefully these wonderful hills will always be something of a secret.